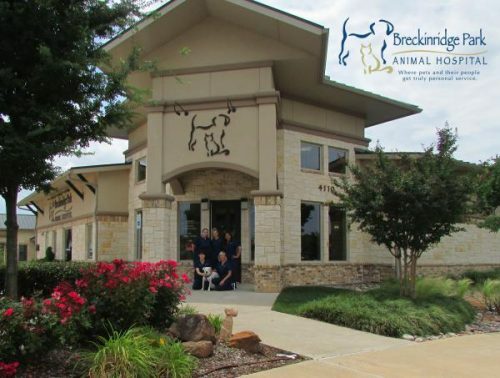 Breckinridge Park Animal Hospital in Richardson, TX strives to give patients the most up-to-date veterinary care possible. This fall 2018, doctors and staff attended veterinary conferences to stay on top of cutting-edge treatments and medicines. This is a highlight of what was learned. Richardson, TX (November, 2018) – The veterinarians and staff at Breckinridge Park Animal Hospital strive to be one of the best animal hospitals in Richardson, Texas. Their goal is to give animal patients and pet owner clients the most up-to-date veterinary care possible. Dr. Erica Erickson, one of the principal veterinarians, shares that large conferences and smaller seminars help staff to learn about cutting-edge treatments and medicines. This fall 2018 Dr. Layne Sager and Practice Manager Sarah Ayers attended the Southwest Veterinary Symposium. Dr. Cinthia Peeples attended the American Association of Feline Practitioners (AAFP) Conference. The Southwest Veterinary Symposium included continuing education, exhibits, interactive labs and social activities. It served DVMs, RVTs, hospital personnel, veterinary and technician students, and suppliers who provide products and services that support veterinary medicine. At the two conferences, Dr. Sager refreshed her knowledge on early disease detection in many areas. Since then, she has been consciously more proactive in screening patients for certain diseases. This can extend the lifetime of patients, and consequently, quality time with family members. For example, protein losing nephropathy in canine patients can be more manageable if caught early. This is a type of kidney disease in which dogs can lose vital proteins through their kidneys. “The specialist at PAC reminded us to “always get the pee” as performing a urinalysis to look for protein in the urine is the best screening test.” Updates and information like this, provided at conference lectures, allowed these Richardson veterinarians to bring information back to their colleagues at Breckinridge Park Animal Hospital. The veterinary team then determined which ideas to implement into the everyday practice. Prolonging and improving a feline patient’s life is very important to the doctors at Breckinridge Park Animal Hospital. According to Dr. Peeples, “We have several feline patients that are 20 years old!” Armed with new information, Dr. Peeples and the staff continue providing caring and cutting-edge medical treatment to give cat patients a long, happy and healthy life. Veterinarians and staff at Breckinridge Park Animal Hospital feel it is crucial to bring pertinent updates and advances to their small animal patients. They strive to help pets prolong their quality of life, and bring joy to their owners for many years. That kind of care and attention to detail is what makes Breckinridge Park Animal Hospital one of the leaders in Richardson veterinary care. Breckinridge Park Animal Hospital serves the northeast Dallas suburban area including Richardson, Garland, Plano, Murphy, Wylie and Mesquite. For more information, please call Breckinridge Park Animal Hospital at 972-690-6900 or visit BPAH.net.